Prolific author Matthew P. Mayo, who often focuses on the American West and New England, has written more than two dozen books and dozens of short stories in the past ten years. His ‘grittiest moments’ non-fiction books include the perennial bestseller Cowboys, Mountain Men, and Grizzly Bears, and his many Westerns include the 2013 Spur Award-winning novel Tucker’s Reckoning. A frequent contributor to anthologies of fiction, Mayo’s stories and essays are especially worth seeking out. His recent work can be found in The Trading Post & Other Frontier Stories (Five Star) and Invigorating Passages (Lowestoft Chronicle), both published in 2018. 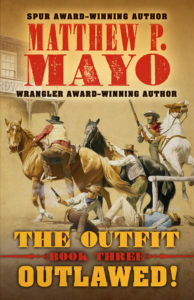 Arguably, Mayo is at the height of his career and writing his best work to date. 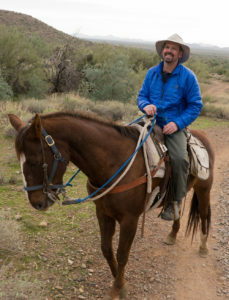 Earlier this year, he won the Spur Award, the Peacemaker Award, and the Wrangler Award for his historical novel Stranded, and his Roamer Western, Timberline, and Blood and Ashes, book two in The Outfit series, received glowing reviews in Booklist, the Lancashire Post and other periodicals. 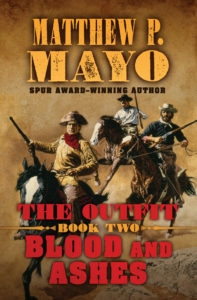 In this exclusive interview with Lowestoft Chronicle, Mayo talks about some of his popular characters, his newest Western adventure series, his recent multi-award-winning young adult historical novel, and his exciting future projects. Lowestoft Chronicle (LC): Matt, the last time I interviewed you, your excellent western THE HUNTED had just been published, and you were putting the finishing touches to DOUBLE CROSS RANCH. I thought Big Charlie Chilton was an inspired choice of hero and rejoiced when he appeared again, a couple of years later, in SHOTGUN CHARLIE. What made you write a prequel rather than a sequel? Might he surface again someday? Matthew P. Mayo (MPM): First of all, thanks for inviting me for an interview—it’s always fun chatting with you. As for Big Charlie Chilton appearing in a prequel rather than a sequel, I recall while writing the novel that served as his first outing, THE HUNTED, that I wanted to know where he came from, so I set out to find out. As to Charlie surfacing again one day, I suspect not, at least not in that guise. That said, he’s not unlike another of my protagonists I’ve been writing about for some time, Roamer, now appearing in a stack of short stories as well as in three novels (WRONG TOWN, NORTH OF FORSAKEN, and TIMBERLINE). 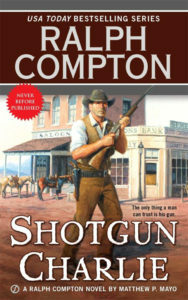 LC: SHOTGUN CHARLIE was the final novel you published with Signet. You placed the next three with Five Star, an imprint of Gale, part of Cengage Learning. Was this a deliberate switch from Signet? MPM: I actually placed my next six novels with Five Star (the two most recent Roamer novels, as well as STRANDED: A STORY OF FRONTIER SURVIVAL, and the three OUTFIT novels). It wasn’t so much a calculated switch from Signet as it was their decision, as with so many publishing houses, to ratchet back their Western offerings. Fortunately, Five Star has been steadily increasing its historical-novel offerings under its “Frontier Fiction” line, which includes among others, traditional Western novels. Five Star is, it must be said, an amazing publisher to work with. The people, from editorial through art, marketing, and accounting, are all top-notch and genuinely concerned with putting out the best books they are capable of. And it shows—I’m proud to have my name on my novels through Five Star. 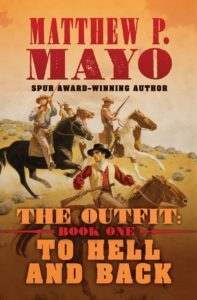 LC: Your western adventure series ‘The Outfit’ differs from your previous westerns in that instead of writing about a drifter, you have a band of heroes working together. You once described it as something like the A-Team of the Old West. Was this series inspired by the A-Team TV show or was that a marketing hook? MPM: I’d long wanted to write something punchier, with an ensemble cast of characters. To that end, I succeeded, though as with my other books, I worked at making the characters human and not caricatures of kind and evil, and the situations tinged with possibility and not (too) outlandish. I also worked to keep excitement and raw danger never far from front-and-center. As far as the A-Team reference I made, it seemed like a bite-size way of describing what I had in mind for the characters and their predicaments. I had a lot of fun working on The Outfit novels, and I hope to revisit the characters—any one of them would be fun to spend more time with—at some point in the future. LC: When you first mentioned The Outfit, a couple of years back, you were finishing up book #2 and preparing to start on book #3. At the time, the series opener, TO HELL AND BACK, had yet to be published. Did you approach Five Star with the idea of a long-standing series, a 3-book series, or did you pitch them one book at a time? MPM: I initially pitched the idea as a series to a different publisher, which they liked, but the money and terms were not favorable, so I declined and sat on the idea for a few years. Five Star liked the idea. They buy on full manuscript, not on proposal, so though it’s a series, they bought the books one at a time. Each came out in successive Octobers: TO HELL AND BACK (Book 1), in 2016; BLOOD & ASHES (Book 2), in 2017; and OUTLAWED! (Book 3), in 2018. LC: The close, joshing relationship between the characters Rafe Barr and the older Cookie McGee is reminiscent of the friendship between Ty Farraday and Uncle Hob from DOUBLE CROSS RANCH. Were Ty and Hob blueprints for Rafe and Cookie? MPM: I think it’s more of a case of me liking such relationships—the wise, older character mixing it up and offering advice to a younger, rough-but-kind mentee, of sorts. Something similar goes on between Maple Jack and Roamer—always with a bit of spice, for fun! LC: There’s an interesting development in BLOOD AND ASHES (The Outfit #2) when the character Susan Pendleton realizes her lifelong dream of working for the Pinkerton Detective Agency. Did Kate Warne, the first female operative to work for that agency, inspire you to make Sue a Pinkerton agent? Also, BLOOD AND ASHES has echoes of The Baltimore Plot, a secessional plot to kill Lincoln, of which the mysterious Warne played a hand. Is the plot to BLOOD AND ASHES loosely based on that real-life incident? MPM: Certainly historic characters, episodes, and events help inform what I write, but I tend to use them more as ideas on which to build my own stories. Sue is becoming a strong character, more self-reliant as time rolls on, which was always my intention, but I didn’t consciously use Kate Warne as a model for Sue. I thought that as an operative she could get into all manner of hijinks and raise a ruckus that men in that position might not be able to. LC: There’s a sense of resolution by the close of OUTLAWED! (Book #3), and yet the series promises to continue. Do you have narrative threads in mind you’re keen to pursue, or is it more a gut feeling you’ll want to return to the series again at a later date? MPM: I have a number of specific ideas for THE OUTFIT I’d like to work with, and a pile of troubles I’d like to throw at the characters, either on their own or as part of a continuation of the ensemble. As to when I’ll add more novels to THE OUTFIT series, it’s not likely to be in the near future. I’m working on a number of ideas, many of them non-Western, that I’m enjoying. But I do intend to write short stories now and again using characters from THE OUTFIT. In fact, I’m working on one now…. LC: Like many, I’m a keen fan of your distinctive, luckless vagabond Roamer, first seen in WRONG TOWN, published by the UK publisher Robert Hale in 2008. That original Roamer adventure, revised and republished over the years (and at some point retitled BLOOD TRAIL TO TALL PINE), still stands as one of your best tales. The follow-up, NORTH OF FORSAKEN, came out in 2017 and a third book, TIMBERLINE, was published last year. Why the long wait for book #2? MPM: Thank you. I’m pleased to hear Roamer is well regarded as I enjoy spending time with him. Regarding WRONG TOWN republished as BLOOD TRAIL TO TALL PINE—that version is a Stateside large-print version. The short answer regarding the wait for Roamer’s second novel-length outing is that I was busy writing other books—non-fiction projects, short stories, novels, and more. But that doesn’t mean I didn’t want to jump into a new Roamer romp at every turn! LC: Roamer and his buddy Maple Jack feature in a number of short stories, including the exceptional ghostly Christmas tale “O Unholy Night.” Do you plan to write more short fiction, Roamer tales or otherwise? MPM: No matter how much time passes between Roamer and Maple Jack adventures, as soon as I begin a new one, be it a short story or a novel, it’s as if no time has passed. I love interacting with them and writing about them. And I look forward to catching up with them again soon. As for Roamer and Maple Jack shorts, yes indeed, I have, in varying stages of construction, a number of short stories, novellas, and novels featuring the duo. I do write lots of short fiction. Much of it is waiting to find a home, some of it eventually gets teased out into something novel length. I’ve published several dozen short stories over the years, steampunk, crime, mystery, thrillers, horror, humor, pulpy noir, Western, barbarian, Sherlock Holmes, and more. In fact, I had a couple of short stories come out last summer. One in a Five Star anthology called THE TRADING POST and another in the latest anthology from Western Fictioneers called THE UNTAMED WEST. I also have a fun bit of fiction coming out in a book in 2019, a collection of real forewords to books that don’t exist. The book is to be called MOVING FOREWORDS, and I’m told it will contain contributions by a number of well-known celebrities (and me … go figure!). LC: You’ve written numerous successful ‘Grittiest Moments’ nonfiction books, including the ever-popular COWBOYS, MOUNTAIN MEN & GRIZZLY BEARS. The novel STRANDED — one of the most remarkable books I’ve read — emanates from the book chapter you wrote about Janette Riker’s harrowing story of survival. It’s my understanding you had very little information about Janette to go on, in which case, how difficult was it turning this brief historical account into a full-blown novel? 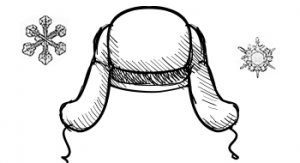 At what point did you know you’d begun penning something extra special? 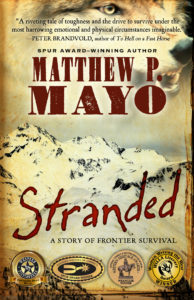 MPM: Thank you for your compliment regarding STRANDED. The novel did come about from research I undertook for the aforementioned non-fiction book. There wasn’t much information available about Miss Riker, but the information that was there was just enough, the perfect skeleton for a novel. I asked myself “what if?” and the story unfolded from there. It’s funny you mention that it seems ‘extra special,’ because that’s how I felt while I was writing it, more and more so as the story unrolled. I feel fortunate to have been the one to help tell Miss Riker’s incredible story of survival. I’m also grateful and overwhelmed by the awards its earned and grand reception it’s received from critics and readers. LC: As a seasoned writer with many published books to your name, do you have a back catalog of unpublished work or do they all find a publisher? MPM: I think most people who have been whapping the keyboard for a while have a few “trunk novels”—that is to say efforts that reside in a trunk or drawer. They can remain unseen/unsold for many reasons including market whims, lack of effort on the author’s part to sell it, or … maybe they’re not all that good. I have four or five novels and some short stories that are pretty much complete but haven’t sold. I revisit them from time to time and vow to get them out and circulating among publishers as time permits. But they have to be good enough. Time tells all. LC: Are you able to talk a little more on upcoming projects? Rumor has it you’re working on a novel featuring William F. “Buffalo Bill” Cody. I also remember you telling me once about a YA steampunk series you were developing which stemmed from your short story ‘Scourge of the Spoils.’ I enjoyed that story very much when I first read it. What’s the latest on the series? MPM: The Buffalo Bill Cody novel is more of a book about other folks in which he plays an important role. It’s roughed out but not completed yet—I can’t wait to finish it! I have another historical YA-crossover novel all but done. It’s about the Sheep Wars in Wyoming. And yes, I have the first in a planned action-heavy series based on my award-nominated steampunky/fantasy/sci-fi short story, “Scourge of the Spoils” from the DAW Books anthology, STEAMPUNK’D! I believe the coming year will bring exciting news about this novel. Stay tuned…. LC: Some years ago, you talked about slowing down in terms of writing, but in recent years you’ve been more productive than ever. Have your recent Spur and Wrangler Awards given you extra motivation to write? MPM: I always wish I could spend more time on fewer projects, but the truth is I love what I do, I’m lucky to be able to do so, and with an indulgent wife, I’m able to pursue it. I write at least 2,000 words a day, and the words and pages and chapters tend to stack up when you pursue something steadily like that. The awards—eight or so for STRANDED alone—are flattering and I’m grateful for the recognition by my fellow writers and by readers, librarians, and judges. The real motivation to write each day comes from something that’s not easy to identify. It’s an urge to share ideas with people. I have more ideas for stories than I have time in life to write them, and I’m glad of it. Of course, the real trick is making certain I’m sharing stories that people want to read. Thank you, Nicholas, for the interview. I appreciate your interest in my work. Matthew P. Mayo is the award-winning author of thirty-plus books and dozens of short stories. 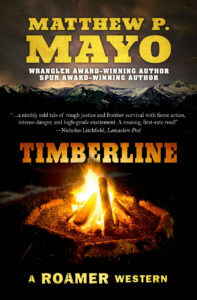 His novel, Tucker’s Reckoning, won the Western Writers of America’s Spur Award for Best Western Novel, and Stranded: A Story of Frontier Survival, won the prestigious Western Heritage Wrangler Award for Outstanding Western Novel, the Spur Award for Best Western Juvenile Fiction, the Peacemaker Award for Best Young Adult Western, and the Willa Award for Best Historical Fiction. It was also a High Plains Book Award Finalist and Will Rogers Medallion Award Finalist. He has been an on-screen expert for a popular TV series about lost treasure in the American West and has had three books optioned for film. Matthew and his wife, photographer and videographer Jennifer Smith-Mayo, run Gritty Press (www.GrittyPress.com) and live in the deepest, forested wildlands of Maine. Rummage around his website (www.MatthewMayo.com) for updates about spurious projects and outrageous outings.